Guys, it's always important to protect yourself when time traveling. The term ‘cult television show' is frequently applied to any slightly interesting show with a group of devoted fans who create websites and dissect every aspect of their favourite program. But there are really only a dozen or so shows that should garner the ‘cult’ tag. Twin Peaks, Freaks & Geeks, The X-Files and Battlestar Galactica are a few shows that are worthy of the 'cult' tag, and so is Quantum Leap. Sam Beckett (Scott Bakula) is a scientist working on a theory for time travel. Sam is anxious to test his theory and prematurely jumps into the Quantum Leap accelerator (in a stylish white body suit) and vanishes. He leaps into the body of an Air Force test pilot and although he realises he is not where he should be, his brain is ‘swiss cheesed’ and he can’t remember who he is or where he should be. Sam’s predicament becomes a little less confusing with the appearance of hologram helper Al (Dean Stockwell). Al worked with Sam on the Quantum Leap project and appears to Sam as a hologram that only Sam can see and hear. Al explains that in order to leap home, Sam must intervene and correct mistakes that have occurred in the past. Once he corrects a mistake at one point in time, he can leap to another point in time and eventually will leap back to his own time, into his own body. Emerging on the television landscape at the very end of the eighties, Quantum Leap made a distinctive mark with only an eight episode first season. The show had no equivalent and immediately spawned a devoted following of fans who call themselves ‘leapers’. The premise behind Quantum Leap is admittedly demented and nonsensical, but it works in every episode and although the first season is short, all the episodes are brilliantly written and make for entertaining and addictive viewing. The show manages to balance heart-warming moments, social commentary and consistent humour with charming characters. Bakula and Stockwell are a perfectly suited on-screen team and because they are the only regular cast members, their interactions are the highlight of every episode. Since the first season only consists of eight episodes, it's impossible to pick a standout or favourite. 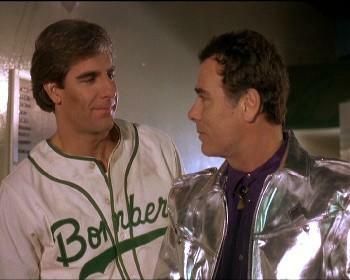 All the episodes are entertaining with Bakula and Stockwell quickly establishing the winning chemistry that would drive the series through its memorable five season run. Sam hops into the accelerator and leaps into the life of Air Force pilot Tom Stratton. Hologram Al tries to explain to Sam that the Quantum Leap project has gone askew and that in order for Sam to leap again he must successfully fly a test plane. 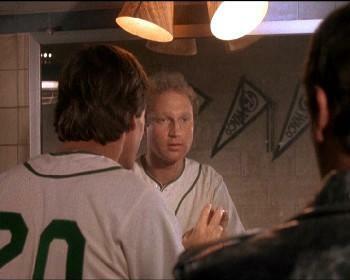 But instead of leaping home, Sam leaps into a baseball player in Texas. Having leapt into Dr. Gerard Bryant, a literature professor, Sam comes in contact with his college sweetheart. I'm in a real identity crisis here, Al! Sam leaps into Kid Cody, a boxer who is being trained by nuns. Sam must win the championship bout to fund a new church for the nuns. Sam is a veterinarian in Texas whose mission is unclear. Is he supposed to win the love of an heiress or save the life of a sick pig? An episode inspired by The Godfather in which Sam leaps into a mafia hit man named Frankie, who has just shot someone. Sam leaps into Jessie Tyler, an ageing black man, living in the American south. Sam’s efforts to save a white woman and his belief in equality create violent reactions in the racist community. Sam experiences life as a high school nerd and must prevent the marriage of his sister to a violent drunk. A Casablanca influenced episode with Sam as Nick Allen, a private investigator who is investigating the murder of his partner. Presented in its original full frame format, Quantum Leap looks pretty impressive. There is an overall softness to the image and slight grain due to the age of the print. Skin tones are realistic and colours are rich, with no evidence of saturation. Shadow detail is respectable with overall details sharp. This is not an outstanding transfer, but there are no major imperfections that spoil the viewing experience. The Dolby Digital Mono package is also quite solid with excellent separation across the front and centre channels. There are a few problems with the original source audio in certain scenes where slight drops in sound or dubbing are obvious. But otherwise this is a very good audio track with dialogue always clear and audible. The first season of Quantum Leap includes a couple of fan friendly extras. Scott Bakula, Dean Stockwell and creator Donald P. Bellisario all enthusiastically participate in A Kiss With History: Remembering Quantum Leap, a wonderful featurette where all three men practically gush about their involvement in the show as well as their appreciation for the devoted fans. While there are only three people interviewed for this feature, they are all wonderful in their interviews. It’s nice to see a retrospective featurette where the people behind the show express appreciation for both the experience of making the show and the faithful support of the fans. 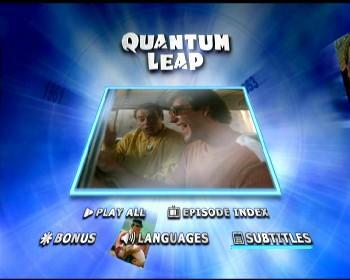 Episode introductions by Scott Bakula entitled Quantum Knowledge are included for all eight episodes. These short interview clips are a nice inclusion in the absence of any audio commentaries. Bakula is once again enthusiastic and articulate as he speaks about guest stars like Teri Hatcher and Jason Priestley, as well as vividly recalling behind the scenes stories. A little surprise on the first disc with two easter eggs promoted as hidden messages from Scott Bakula. Both clips are easily available by clicking around the main menu and feature Bakula discussing the significant of fan support and the importance of not watching the episode introductions if you haven't seen the show before. I've previously confessed feeding my addiction to nostalgia with constant trips down '80s TV memory lane. So it's stupendous that shows like The A-Team, Miami Vice, Macgyver, Magnum P.I. 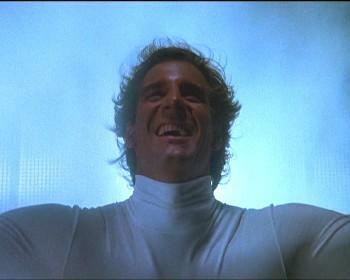 and Quantum Leap are finally being released on DVD to feed my addiction. Although the video and and audio transfers are not reference quality, there are no major problems that should discourage you from buying the first season of Quantum Leap.